It’s not a normal day until my daughter wheels around a trolley or drags around a bucket filled with things she has collected from around the house. 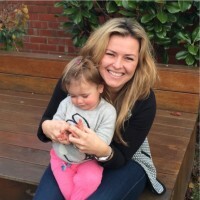 Everything from blocks, bears, shoes – even my hair brush – gets a look in. And it’s the most fun game of all, judging by how long it lasts. So, The Cargo Line from Studio delle Alpi is, I think, probably the most useful toy around. The trailer can be used separately or with the little box neatly sitting on top. 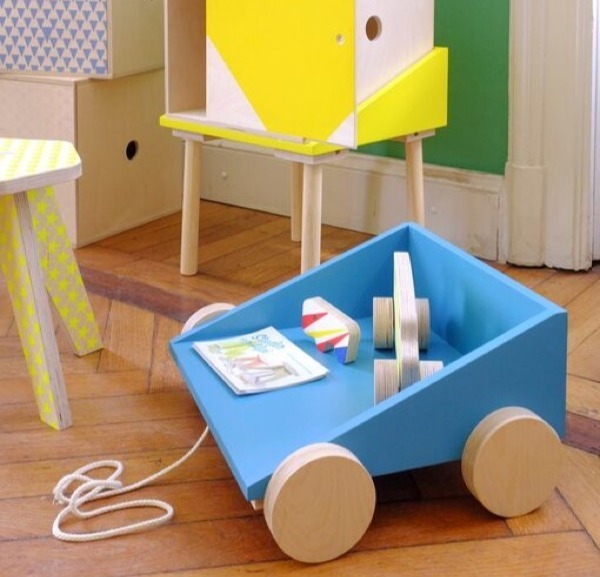 In fact, the box is multipurpose – you can actually use it as a rather trendy toy box, floor cabinet or even a bedside table when your little one is done wheeling it around. You can stack the boxes or rotate them to display any side you like. The plywood boxes have a sliding door and are screen printed with various pastel colour combinations and patterns. The trailers, also made from wood, come in several different colours, including the white, blue and yellow ones shown in this post. Unfortunately, The Cargo Line isn’t actually available to purchase just yet. It’s still in prototype mode. But I’m told that Studio delle Alpi is working hard to get it ready – hopefully by the end of this year. We’ve often ogled over Studio delle Alpi products here at Babyology. 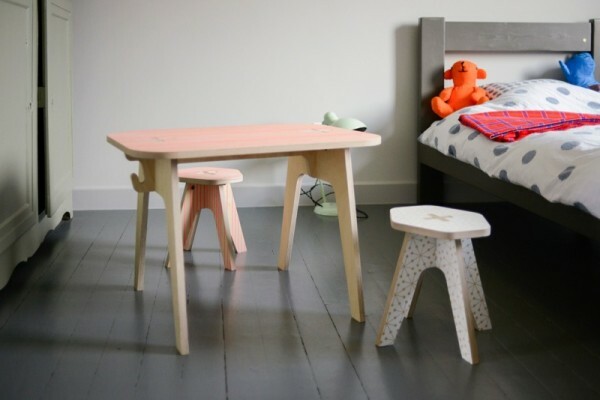 Check out the adorable Office Table and stool pictured below. You may remember our post last year on the company’s amazing flat-packed furniture. The company was founded by two passionate designers, Anne Kieffer and Arnaud Mouriamé, who work and live between Luxembourg and Milan. They like to create wooden objects that are simple, amusing and create a happy atmosphere in the house (which they certainly appear to be achieving). We’ll let you know when The Cargo Line is available for purchase.